Moving a university from a compliance mode of accreditation assessment to a transformative mode is a complex task, yet it is the task brought on by changing requirements of accrediting bodies. To get there, the university (viewed as a collection of learners) needs some scaffolding and some easy place to get started. Washington State University is accredited by the Northwest Commission on Colleges and Universities (NWCCU). The NWCCU is engaged in a process to review its standards. The process includes drafting some new standards and converting the review from a decennial calendar to a new septennial review schedule and adding a new catalog of types of reports that institutions must produce. For the WSU core themes tied to student learning outcomes, the university will need assessments conducted with respect to the goals of its themes – implemented in ways that can be “rolled up” from program to college to university levels. WSU may elect to use something like its Six Learning Goals as the intended outcomes for its core themes that deal with student learning. The challenge is to help programs move toward having and using indicators of achievement of WSU’s chosen outcomes, and to do so in a way that helps programs and colleges use the data to improve, rather than just performing a compliance activity (that is, developing a transformative approach to their assessment). The further challenge is to accomplish this in a resource-constrained environment. Theron and I have been looking for a place that all ~100 undergraduate programs at WSU could start working toward meeting these requirements in time for a 2011 delivery date of a Year 1 report. Figure 1. 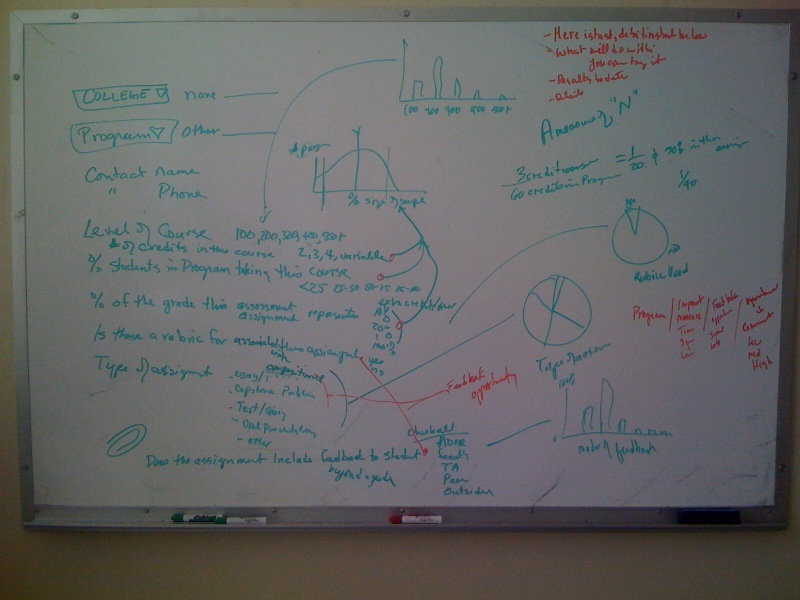 A brainstormed diagram of the kinds of metadata that would need to be collected with each assignment and the graphical analysis that could be done with the data. A simple message to communicate. “Give us 3 assignments, we’ll help you get feedback to improve the assignments AND to meet NWCCU requirements”. (Provost to deans, deans to chairs, chairs to faculty, CTLT staff to WSU community. ) A simple message is less likely to get confused and become a “telephone game” nightmare. A manageable and understandable process. Specifically, communities important to faculty and instructors. With most programs doing the same thing, WSU can develop opportunities for shared models, resources and interdisciplinary partnerships. Feedback from a broad range of stakeholders. WSU’s Center for Teaching Learning and Technology has previously done work to map assignments to WSU’s Six Learning Goals using this proposed form (developed with the WSU Honors College): and in this case study with a academic program. Or the mapping to WSU’s goals could be implemented more indirectly by scoring the assignment with WSU’s Critical and Integrating Thinking Rubric and then mapping the rubric to WSU’s six goals. If the program already has a rubric that is has been using, that rubric could be incorporated into the process and mapped to the WSU goals, see figure 2. Figure 2. 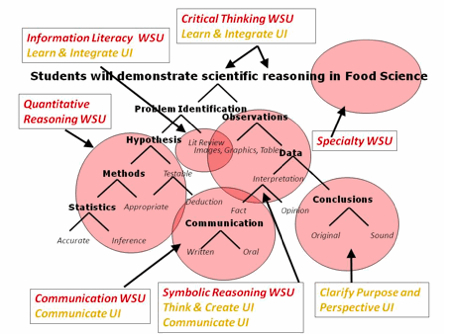 Diagram of the mapping process from the Food Science rubric to the WSU Six goals and the the University of Idaho (UI) five goals. If the University changes its goals, the mapping can be readily changed, as illustrated by this joint WSU-UI program that is mapping its rubric to WSU's 6 goals and UI's 5 goals simultaneously. The rating itself could be managed in a manner similar to the one we demonstrated to harvest feedback on an assignment, figure 3. Unlike that demonstration, in the pilot year of this proposed assessment plan, programs might only be asked to provide sample assignments and not the associated student work. In subsequent years, programs may elect to use the full harvesting model, or may elect to use other assessments to provide triangulation to this approach. Figure 3. Harvesting Feedback process gives results to the instructor (about the assignment) and to the program (about the assignments in aggregate and about the utility of the rubric used). Academic programs deposit 3 sample assignments and fill in a form describing the courses where the assignments are given. 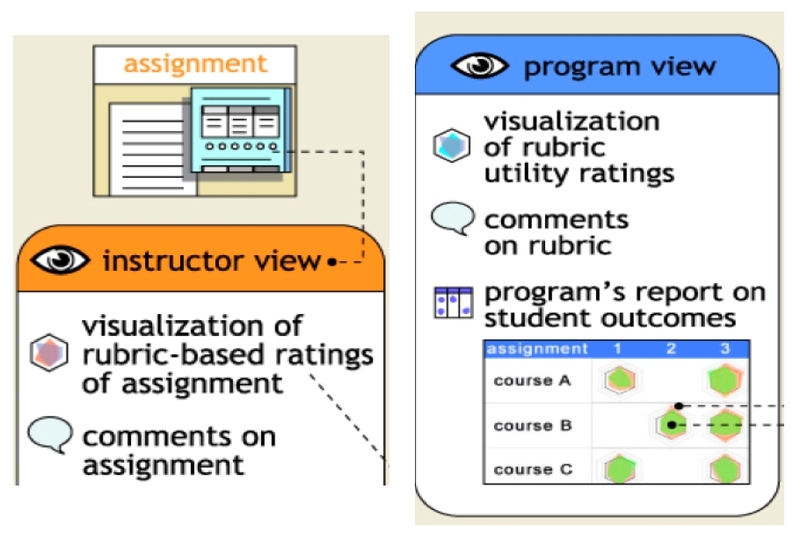 The assignments are scored with a rubric (based on the WSU’s Goals, or the Critical Thinking Rubric, or a rubric that the program already uses to assess student work. The program can choose the rubric.) The program can help recruit the assessors from communities that have interest in the program’s success. The rubric is mapped to WSU’s chosen goals so the results can be rolled up from Program to College to University levels. Programs examine the feedback from the assessments, engage in conversations about it and choose action plans for the coming year; instructors can get specific feedback about their assignment to engage in SOTL or other process improvement. The whole process is assessed with a transformative assessment rubric to judge the quality of the assessment activity and suggest refinements in the assessment practice. The results of that assessment can be submitted, along with a mapping of the relevant data to WSU’s Goals. The assessment process is assessed, as above, to judge the quality of the assessment activity and to benchmark the program against all other WSU programs. By using the Harvesting process to implement both the assessment of the assignment and the assessment of the assessments, it should be fairly simple to gather input about the program from a community that is relevant to, and interested in, the academic program’s success and to document the success of the assessment efforts. Once programs have begun to engage in the discussions that we think these activities will trigger, they may elect to proceed in many directions that include: broadening the scope their assessment activities, refining the assignments or the criteria for assessing them, expanding the communities giving feedback, or assessing student work along with the assignments to gage how effective the assignments really are in impacting student learning. We have proposed programs get started toward the new accreditation standards by harvesting assessments on their assignments, but this is not the only place to put a toe into the water. Syllabi or student work would be another place to start. Ultimately, we think programs should have direct measures of both student learning and faculty learning, and be able to talk about action plans related to improving that learning and/ or improving the assessment of that learning.